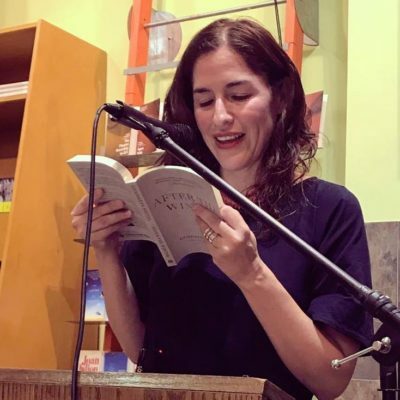 We continue to discuss Guadalupe Nettel’s After the Winter, translated by Rosalind Harvey, with notes from her recent reading at Oakland’s East Bay Booksellers. Join the conversation at #TheCATBookClub. In the latest CAT book club post, we introduced Guadalupe Nettel and touched upon some of the reviews of her latest book in English, After the Winter, translated by Rosalind Harvey. We were lucky enough to host the Mexican writer here in the Bay Area for a reading at East Bay Booksellers. Brad Johnson, the bookstore’s owner, moderated the conversation. Since the novel alternates between two narrators, Claudio and Cecilia, Johnson and Nettel decided to trade off reading those parts as well, with Johnson giving us his rendition of the surly, noise-sensitive Cuban, Claudio, and Nettel as Claudia, a young Mexican living in Paris. We’ll have audio up on the website before too long, but in the meantime, we wanted to share these insightful notes from that conversation. Nettel on the origin of her characters. Claudio began as a kind of stereotype of the hyper-masculine Cuban male, based on some Cuban men she has known. She described how over the course of writing the novel, however, she dove deeper into his character and his past growing up in communist Cuba, in order to unravel how he got to be the way he is. Cecilia, she said, originates as a version of the author herself in her youth. Cities. Nettel described New York and Paris as cities that are cold to outsiders. Therefore, the “winter” of the title refers both to the season and the frigidity of a foreign, urban environment. She spoke of the “trauma” of living in a different culture, primarily the trauma of isolation. Both Claudio and Cecilia suffer from isolation in the novel. Despite this trauma, Nettel emphasized the opportunity for connection with others, and pointed to the moments of connection between characters as illustrations of hope. A Mexican in Paris. Nettel spent time living in Paris and explained that some of Cecilia’s experiences in Paris come directly from her own memories or even from her old diaries, which she revisited while writing the novel. For example, Nettel recalled how Parisians often insisted that she was Peruvian, despite the fact that she had told them she was from Mexico. In the novel, the same thing happens to Cecilia in a Parisian bakery. Cemeteries. Cemeteries play a role in the novel, and Nettel revealed her own personal affinity for them. In fact, Nettel lived in an apartment overlooking the Père Lachaise Cemetery while working on the novel. From her apartment windows, she could watch people interacting with the graves. She also talked about discovering the Catacombs and the fact that Paris is a giant graveyard. Translation. When asked about the translation process, Guadalupe Nettel spoke of her own work as a translator (from French to Spanish, primarily). She also pointed out that in the original Spanish novel, she wrote Claudio’s parts in Cuban Spanish, full of Cuban slang, and wrote Cecilia’s part in Mexican Spanish. How to convey that in the English was tough, she said, and she and Rosalind Harvey decided to have Claudio’s parts written in American English and Cecilia’s parts written in a slightly more British English. Stay tuned for audio from the event, which includes Guadalupe Nettel reading a passage from the novel in Spanish. And head over to our Facebook and Twitter pages to join the conversation!